September 24, 2016 September 17, 2016 by Beau H.
A bold print grounded by a fall-ready pattern, with neat styling touches that make it more wearable than you think. A guy can never have enough durable and easily wearable shirts in his wardrobe, right? That’s absolutely right. That’s what makes the Luxtility Editor Shirt from Batch Men’s such a neat introduction into the marketplace. And that’s particularly what makes the style seen here — the Editor Shirt in Navy Foliole — an equally neat introduction into the #menswear space. So if you’re not yet familiar with Batch, today’s a great Saturday to get yourself acquainted. 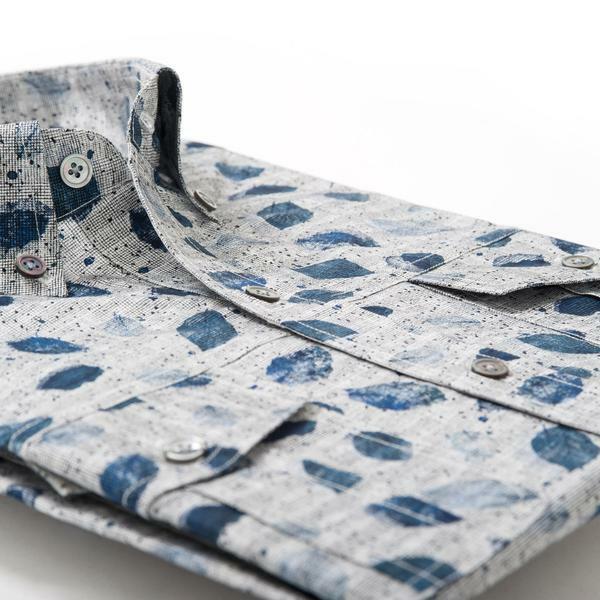 The new, start-up brand — based in Florida — produces its shirts (a blend of “luxury” and “utility”) in small batches, hence the name. They’ve worked with tailors to dial in an essential, modern fit, and that’s a positive for us fans of great-fitting menswear. I had the chance to test out the brand’s Specialist Luxtility Shirt (so named for its specialized, utilitarian style) and found the fit and deep navy color to be ideal for pairing with a casual weekend ensemble — yes, even untucked. The Editor Shirt shown here — again named for the precise guy who curates his lifestyle succinctly — continues that trend quite nicely, featuring a tapered fit through the sleeves and chest, plus that terrific pattern. Seriously, if you think prints should be left behind in spring and summer, think again. The deep blue print shown here nicely offsets a classic cold-weather Glen plaid base, something seen rarely — if at all — in casual shirting. That combo is going to bring it nicely into the rich color hues of fall (changing leaves and all). 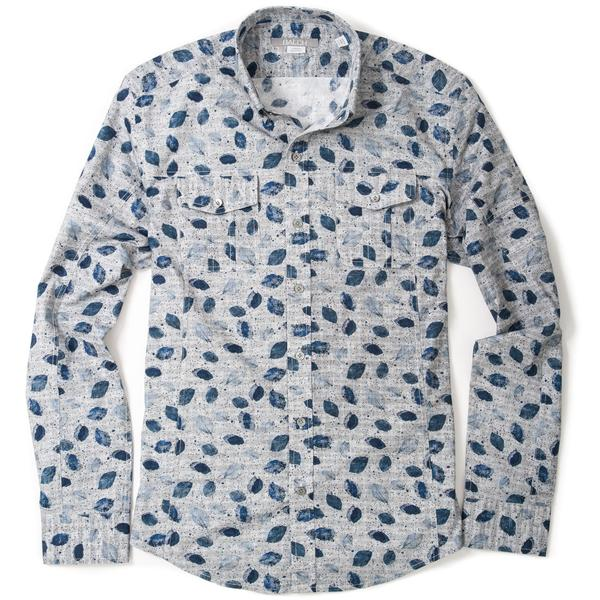 And if you’re looking to be a guy who switches things up with the seasons, look no further than this shirt as a starting point. Front chest pockets, a subtle Glen plaid base and a slim fit keep this shirt grounded and ready for casual style galore. Although it might seem difficult to wear a printed shirt like this at first, it’s a matter of pairing it up with straightforward style essentials for the fall — like garment-dyed jeans and crisp high-top sneakers (two of which you can find in this #OOTD). Neutral pieces like slim sand chinos can also help ground this piece, which is a positive if you’re hoping to wear it more casually. It’s just the right length to be worn untucked, and that slim fit keeps the shirt tucked in if you do go that route. The military details on the Luxtility Editor Shirt — including those chest pockets — help break up the pattern and add some rugged flair. And, like the Specialist Luxtility Shirt, it’s going to feel substantial but not scratchy, unlike other mercerized cotton shirts. If that’s not enough of a draw for $84 — which it should be! — know that these shirts are made in small quantities and offer a reliable change of pace from a classic chambray shirt or a blue Oxford. Oh, and you can wear ’em just about any other time of the year, too. For now, rock it with dark blue denim and brown leather Chelsea boots. Then, layer it under a navy crewneck sweater with your favorite slim chinos (and those same Chelsea boots) as it gets chillier this fall. While you mull over its styling potential, take a spin through the Batch Shirts site and check out this piece again … and again.